This past year has brought many changes and while making stays and researching stays has been ongoing, blogging has lagged behind. Will try and catch up with some new images and information. 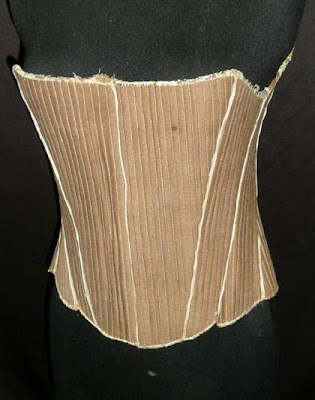 Three new pages have been created, the first is the documentation of the process of recreating a pair of 17th century stays for an exhibit at Pilgrim Hall in Plymouth, Massachusetts. Yellow silk covered stays, c 1670. The other is a page devoted to capturing images from online auctions of stays, which once purchased are lost to researchers. These stays were at auction on Ebay. The third new page is a listing of online images of original stays in museum collections. I'm glad to see you blogging again! I always enjoy your posts. And I love those yellow stays! I have a question about your recreation. Do you think the yellow stays were worn primarily as undergarments, or might they have had detachable sleeves so that they could be worn as a bodice? Since the original shoulder strap is gone missing, I would speculate that these could have had sleeves that tied on as does the pair at the Met linked above. The dating of these stays is based on the entry in the will by Mary listing a pair of "bodies" which may or may not actually be these stays. There was no description. The front fingers on either side of the spade (center front) are decorated with woven tape as is the spade itself. The back and back fingers are not decorated which would suggest these stays were meant to be seen and would serve as a stomacher in the emerging fashion of the mantua.